Without doubt, Chili is one of the world’s favorite one-pot stews. 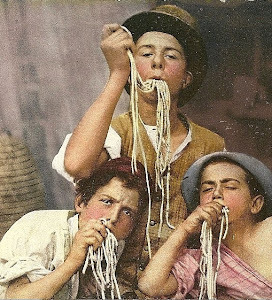 But to qualify it as great taste might be a bit stretched. Yet, after a few hours of simmering on a kettle BBQ or smoker, this preparation of Chili renders a hint of smokiness that lifts it to a whole new level of ‘comfort food’. I accidentally discovered this unique flavor on New Year’s day, when I had some friends coming over and wanted to surprise them with a sturdy dish to help soothe the hangover from the night before. I had prepared the Chili a couple of days before and it just needed an hour of slow simmering to reheat. To keep the dutch oven with Chili out of view, I moved it outside to my kettle BBQ for a few hours of slow simmering. The result was incredible! Of course you can make this dish on any other day of the year as well. For this recipe you'll need this type of BBQ or something else that has a lid and is big enough to hold your dutch oven or iron pan. Also make sure you use a cast iron pan or something else that can take the direct heat from the coals. With that sorted, let's get started by firing up the BBQ! Like most traditional dishes, there is a lot of controversy on what should go in this dish: beans or no beans, tomatoes or not, meat or no meat... So this needs a little disclaimer to avoid any bickering: this is my version of Chili con Carne, based on the traditional Spanish dish of chili peppers, beef, tomatoes and red kidney beans. 120 gr of your favorite chili spice mix (mine has ground chili peppers, onion powder, cumin, garlic powder and dried oregano). Nowhere in the traditional recipe, but I like to add bell peppers to my Chili. I roast them in foil, remove the skin and finely dice the meat before adding them to the dish. Wrap the bell peppers in tin foil (shiny side in!) and cook them in an oven (180˚C) for 45 minutes or, in this case on the BBQ. Move the peppers to the BBQ, place aside direct heat from the coal, close the lid and slowly roast for an hour. Firmly brown the minced beef in small portions in a skillet on your stove. Transfer to a dutch oven and add the tomato puree and diced tomatoes. Do not fry the tomato puree. We need the acidity. Open the tin foil and leave the bell peppers to cool. Once fully cooled down, the skin will come off very easily. Remove the stem and insides. Finely chop the bell peppers and add them to the chili. Put the canned beans in a colander, drain off any liquid and rinse thoroughly. Leaving the liquid makes your Chili way too starchy. Add the beans to your Chili. Add your Chili spice mix, a table spoon of worcester sause, hot sauce (I used Tabasco) and the stick of cinnamon. I like spicy, so I added some extra cayenne pepper and ground chili peppers. Mince the onions and fry them in the same pan you used for the meat. Do not clean the pan in between. We want the onions to deglaze the pan and get all the meat flavors in our chili. ..and transfer the onions to your Chili. Add just enough water to cover. Bring the Chili to a simmer on your regular stove. Once you have brought the Chili to a firm simmer, move your dutch oven to the BBQ. Place aside the direct heat from the coals. The last ingredient: a shot (or two) of Jack Daniels. This will add a nice taste of vanilla and almonds, but also some additional smokiness. Do not put a lid on the pan. Just close the lid of your BBQ and leave to simmer for at least one, but preferably two hours. This will allow the smoke to permeate the Chili. Longer cooking times will bring down the freshness of the peppers and the tomatoes, which should be avoided. You might consider adding some cherry or oak wood to the fire to boost the smoke, but it's not really necessary. Stir occasionally and add some water if needed. And there you have it. A nice big bowl of steamy, spicy goodness. I hope you'll find like I did, that the hint of smoke really adds to the flavor of the Chili. There's many different toppings like diced raw onions and sour cream. 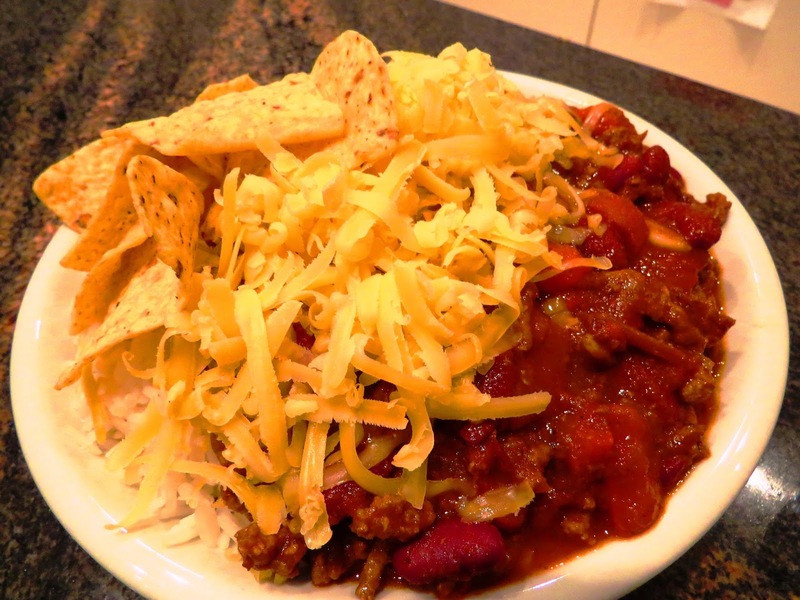 I like my Chili con Carne served over white rice with corn chips and shredded Gouda cheese. Hope you give this a try.